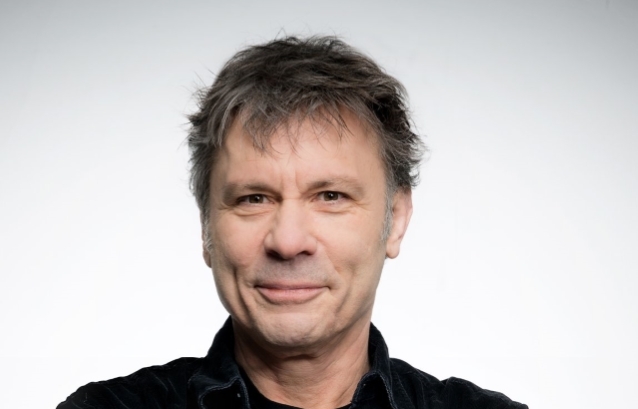 IRON MAIDEN frontman Bruce Dickinson has called the concept of multitasking "absolute rubbish," explaining that people who can juggle lots of things at the same time are actually good at rapid task switching. The singer, who is also a world-class fencer, novelist, screenwriter, radio host, beer brewer, motivational speaker and commercial and private pilot, is making a string of speaking appearances on the back of his recently released autobiography, "What Does This Button Do?". On the tour, Dickinson is reading excerpts from his book, delivering slides and hosting a question-and-answer session in which fans can ask all the questions they have been dying to know about what it's like to front one of music's most iconic bands. During his September 11 spoken-word gig at Folketeateret in Oslo, Norway, Dickinson was asked by a fan for his advice on optimizing his schedule for motivation and focus. He responded (see video below): "Well, I actually try and do things one thing at a time, 'cause it's all I can manage. I've discovered that if I try to do two things at a time, like for example eating with a knife and fork whilst at the same time trying to play chess, one of them has to suffer inevitably. So as simple as it may sound, just do whatever it is you're doing — do that — and then do something else. "All this stuff about multitasking, it's rubbish — rubbish; absolute rubbish," he continued. "Women cannot multitask. Men cannot multitask. But some people are better at going from one thing to the other thing to the other thing to the other thing and back to the other thing and everything else like that. But if they're gonna be successful at that, they're gonna do one thing at a time and change rapidly from one to the other. That's not multitasking; that's figuring out how to change rapidly from one thing to the other." "What Does This Button Do? ", landed at No. 10 on the New York Times "Hardcover Nonfiction" best sellers list. It was released in the U.S. last October via Dey Street Books (formerly It Books), an imprint of HarperCollins Publishers. Dickinson joined IRON MAIDEN in 1981, replacing Paul Di'Anno, and made his recording debut with the band on the 1982 album "The Number Of The Beast". He quit the band in 1993, pursuing several solo projects, and rejoined in 1999. Dickinson, who turned 60 last month, has several other interests beyond music. He is a licensed commercial pilot and owns an aviation company. He has written other books, done some acting and brewed beer. In 2015, he completed a round of chemotherapy for a tumor on the back of his tongue and was given a clean bill of health.